The combination of white lotus root pieces swimming in pickle juices next to vibrant red and yellow bell pepper slices makes the whole product look like an edible flower arrangement. The jarred product is the result of a marriage between a flower designer and her lotus root farmer husband, a combination that allows the former to match the local specialty crop with her floriculture background and imagination to create flowery lotus root, or "Hana-Renkon" as the product is marketed. "I wanted to embody the image of a bright farming village and I'm glad that I succeeded in making it a reality inside a small jar, using lotus root," said Sumiko Saito, 70, who lives in the city of Naruto in the western Japan prefecture of Tokushima. Lotus flowers are popular worldwide as ornamental plants, but in Japan and China, its subterranean stem, a fiber-rich vegetable containing vitamin C and minerals such as iron and potassium, is a traditional element to many meals. The main cooking method for lotus root is to boil or saute it in soy sauce. It is considered lucky in Japan as people believe it is possible to see into the future through the many holes that reveal themselves when the root is sliced. It is also an essential ingredient in festive dishes during the New Year period, with shipments peaking in December. In Tokushima, Japan's second largest lotus root producing area after Ibaraki Prefecture, about 7,000 tons are harvested every year and Naruto is a core production site because of its clay-rich soil. Saito, born into a family that managed a Buddhist temple founded in 1308 in the nearby city of Awa, has loved flowers since childhood. Influenced by her grandmother, a teacher of the art of flower arranging who always decorated the temple and her home with seasonal blossoms, Saito decided to follow in her footsteps and pursue flowers as a career. When she married Yuji Saito, an eighth-generation lotus root farmer in Naruto, she was busy with her professional flower design work. 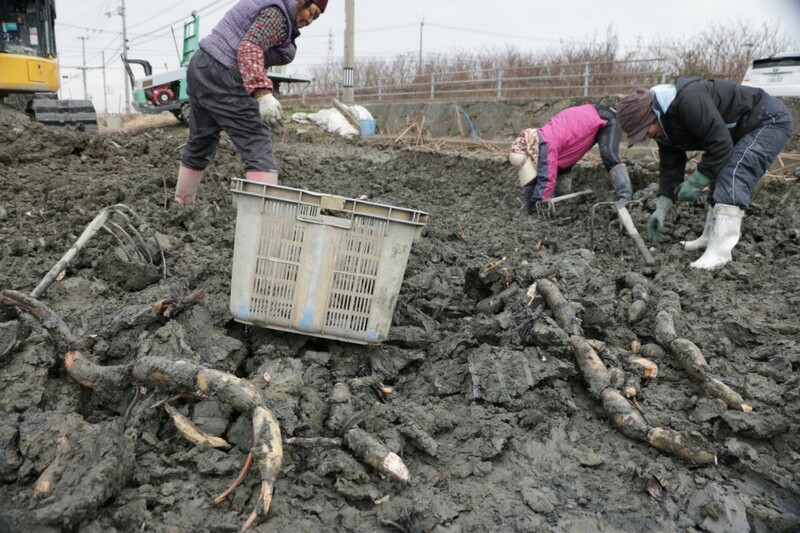 At that time, wives of farmers were supposed to quit their jobs and help the family business, as did all the other wives in Saito's lotus root farming neighborhood. But Saito's parents-in-law agreed she should continue her career as a flower arranger instead of picking up a hoe and shovel, so to speak. Saito takes pride in her bouquets, but, at the same time, she felt a twinge of guilt when she thought of other local women doing the heavy lifting on their family farms. She spent many years wondering how she could use lotus root to contribute to her community. A turning point in Saito's life came in 2013 when she entered a local competition in which contestants vied to create inventive processed farm products. 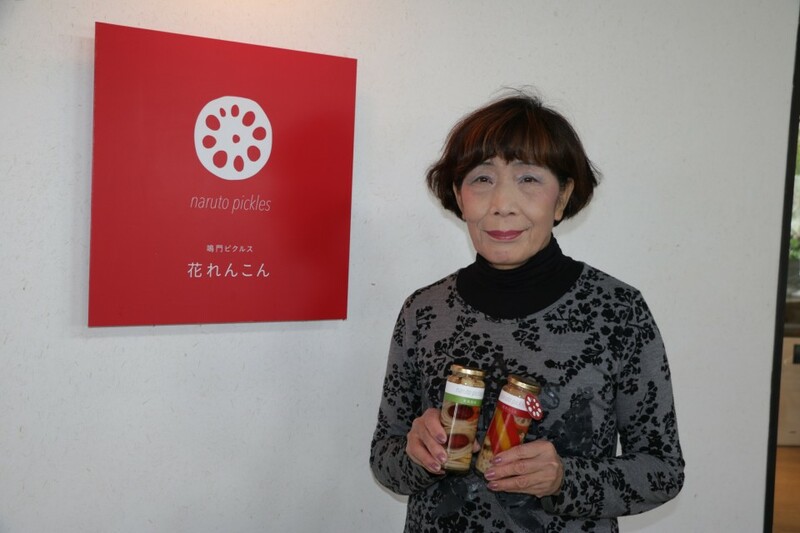 In the event organized by Tokushima Prefecture, she won second prize with her creation of lotus root pickles. The original idea was to utilize smaller lotus roots that are usually disposed of but deemed suitable for eating raw due to their soft texture. They had a diameter of about 5 centimeters, about half the size of those selling on the market. 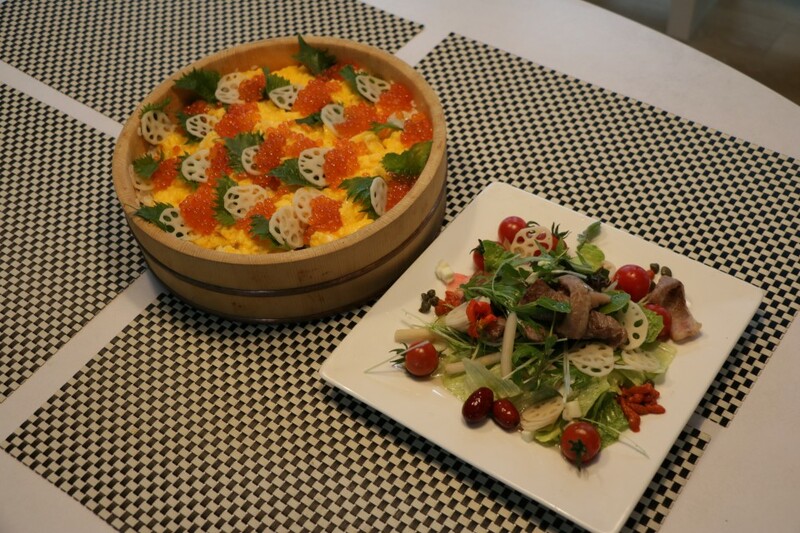 To enhance the vividness of Hana-Renkon, Saito added bell peppers and other lotus parts such as stalks and seeds. After winning the prize, a Tokushima government official encouraged her to commercialize the bottled pickles, and she followed the advice. Saito's husband died of an illness in 2003, but his son Akira, 42, who had been working as a business consultant in Osaka for about 10 years, returned home in the summer of 2015 to help. 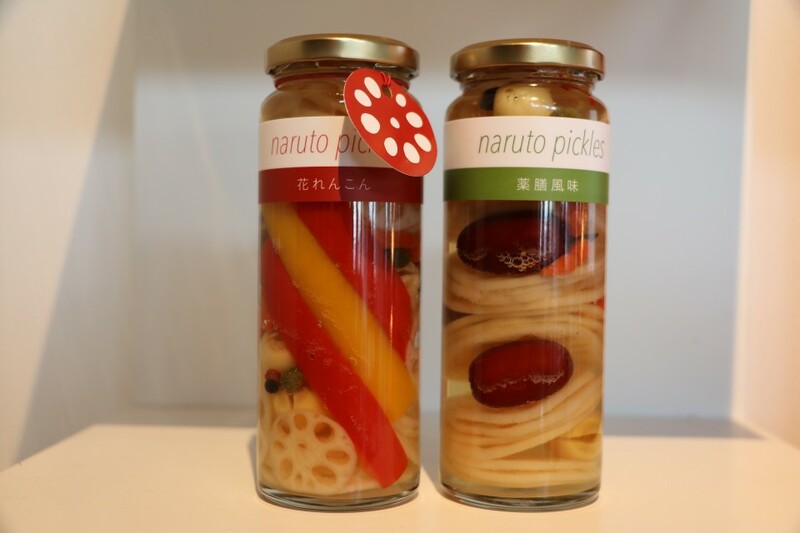 They officially began production of the Hana-Renkon pickles in November that year. Commercializing the product was a continuous process of trial and error. They struggled to create a product which would remain fresh without any additives while being mild, tasty and safe. "In flower arrangement, you are free to be (creative), but when it comes to food, you need to produce the same items at all times and as safely as possible. This was the hardest part," Saito recalled of the early days. They reduced the acidity of the pickle juice by adding "wasanbon" refined sugar, another local specialty, so as to make it easier for children and the elderly to eat. To keep lotus roots fresh, the product is made within 24 hours of harvesting the crop. Hana-Renkon is currently sold for about 1,300 yen ($12) per jar at Saito's store, plus at a dozen shops in the prefecture and online. "The first impression of Hana-Renkon was how brilliant they are," said Nayumi Kawata, representative of Suimii, a trading firm in the region that promotes products by local small businesses. The group has sold Hana-Renkon at a monthly outdoor market held in the city of Tokushima for about two years. "Its vivid color is a big strength. Many visitors stop walking when the product comes into view and immediately pick it up," Kawata said. Even so, Akira expressed worries over the future of the local lotus root industry, citing the increase of Chinese lotus root imports and the advancing age of farmers. "I heard there were 400 or 500 lotus root farmers in Naruto about 40 years ago, but now the number has almost halved," he said. Akira called lotus roots "outstanding supporting actors" which can garnish main dishes, and said he believes enhancing that role is the key to increasing their popularity. Saito and Akira are also considering selling Hana-Renkon overseas in the future. 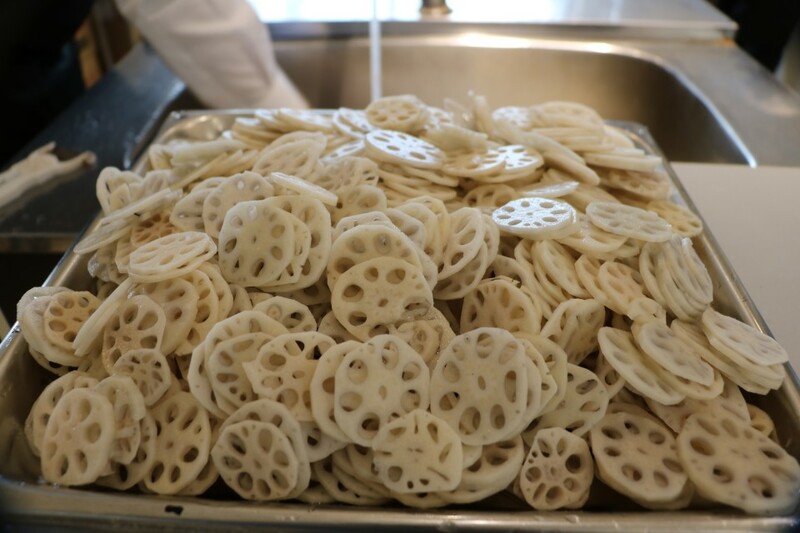 "Only a few countries habitually eat lotus root, so I want more people around the world to know how tasty and how healthy it is by offering pickled ones. In doing so, I'd like to contribute to the local community, too," Saito said.